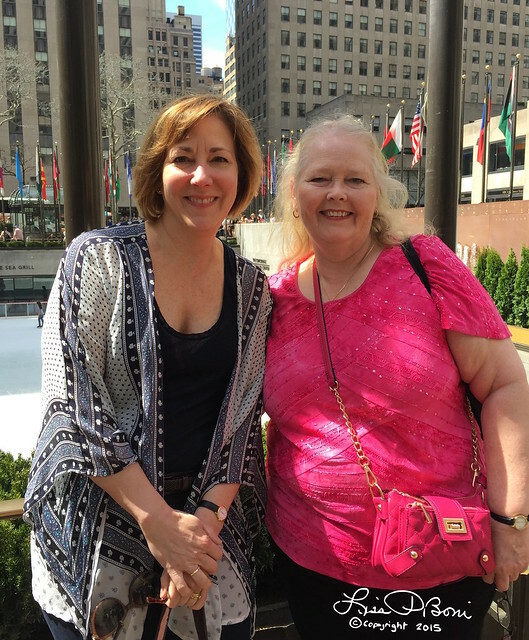 The first portion of my trip was to New York City where I was able to spend some time with a couple of dear friends! Gail (above) and Heidi (who I managed unfortunately to not get a good photo of) spent Saturday showing me around the city! We started at "Ellen's Stardust Diner" where we were entertained by lots of Broadway hopefuls and a lovely breakfast! Next stop was Rockefeller Plaza where they were still ice skating! 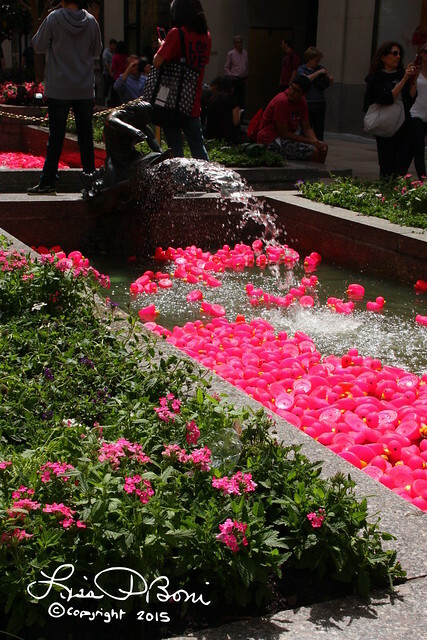 The fountains looked like they were filled with bright pink flowers - but the "flowers" turned out to be bright pink rubber duckies! 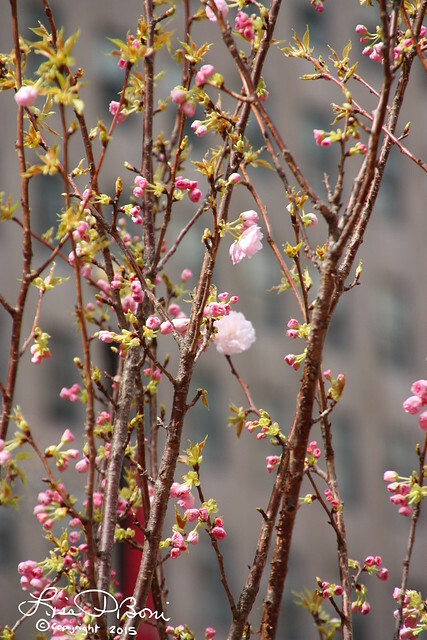 The trees were just starting to blossom! So beautiful! 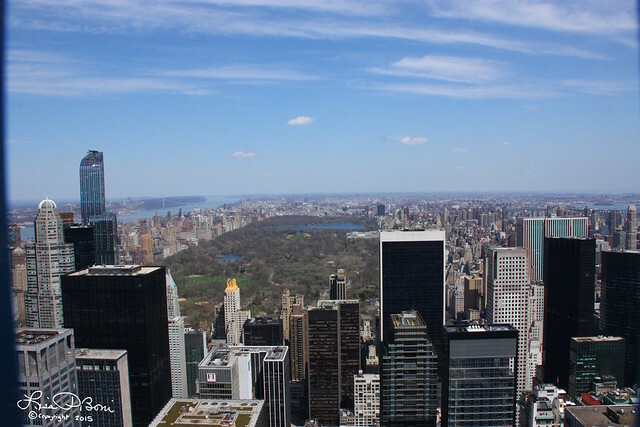 From the "Top of the Rock", we had glorious views of Central Park and the Manhattan skyline in all directions! 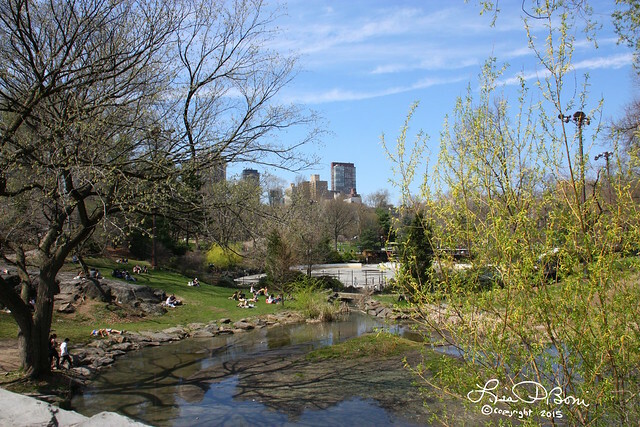 A walk through Central Park revealed spring popping up all over! 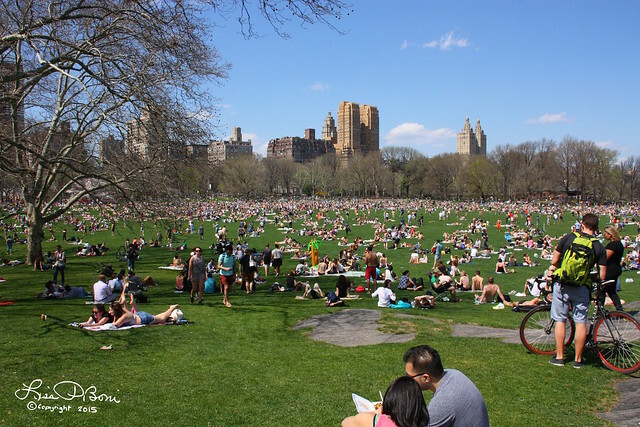 As the day progressed, the park filled with more and more people! It was amazing to see the huge green covered with blankets and so many people! 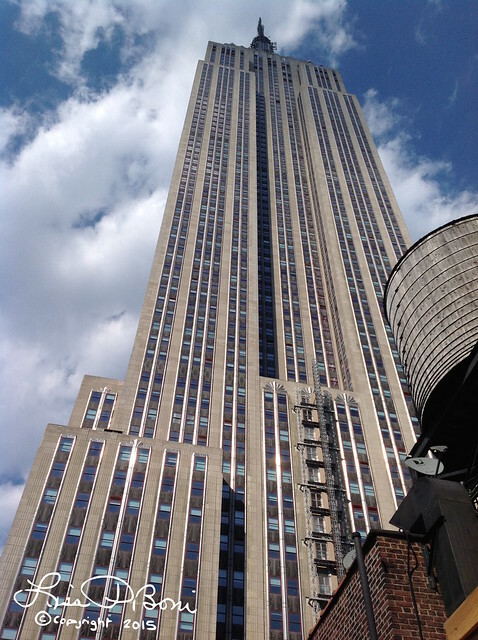 In the afternoon, we made our way to my hotel room, which was purported to have a balcony view of the Empire State Building. 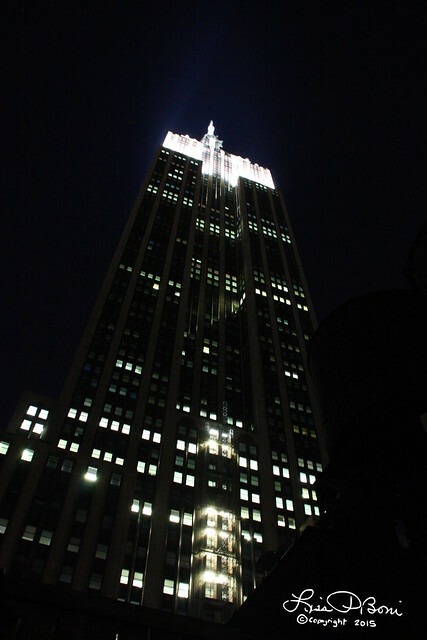 How surprised I was to discover that the balcony was actually a rooftop patio larger than the hotel room with an amazing view looking up to the Empire State Building! It was just as lovely at night! Gail and her husband treated me to a lovely dinner out and a night at the Theater where we saw "The Audience" with Helen Mirren! It was fabulous and a special experience that I will long remember! Thank you Gail! On Sunday, the weather continued beautifully warm and I took advantage of it by spending the morning sitting on my rooftop deck and sketching, then spending the rest of the day exploring the garment district and doing a bit of shopping. 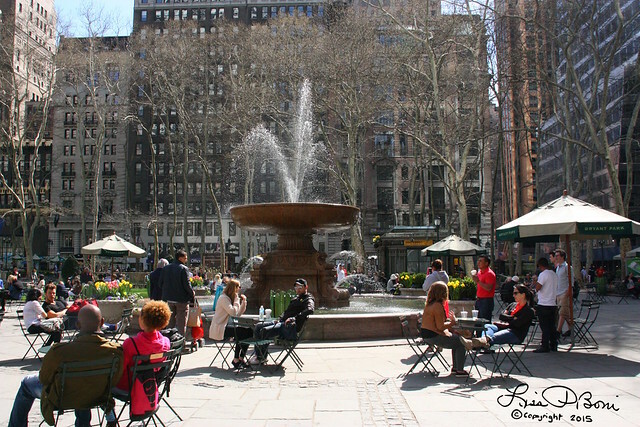 Bryant Park was lovely and I ended up spending a good part of the afternoon sitting at a table here enjoying the park and eating lunch. The little kiosk restaurant was decorated with so many gorgeous spring flowers! 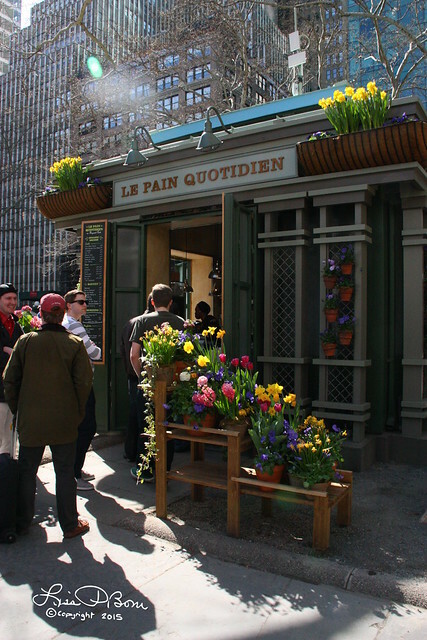 I had the best grilled cheese sandwich here with gruyere cheese and sautéed mushrooms! Yum! 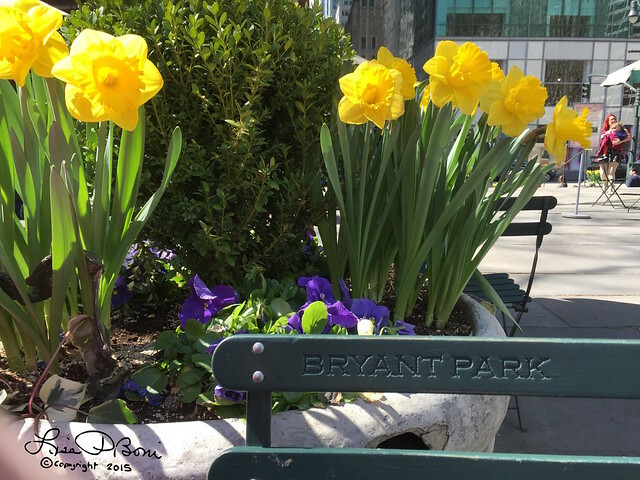 I loved how all around the city, the parks and public spaces were filled with pots of spring flowers! They really celebrate the seasons! 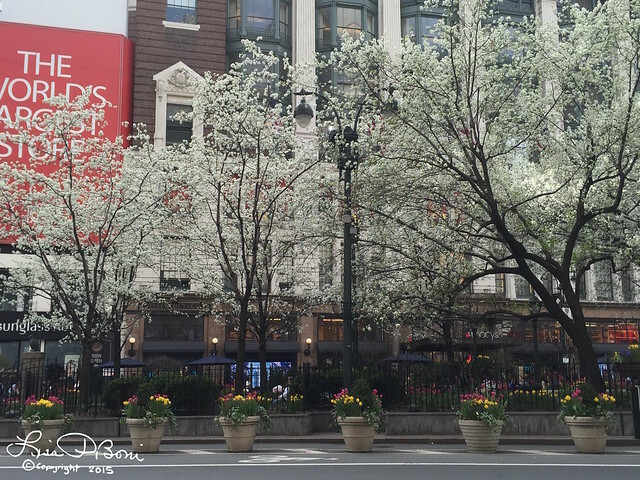 All the trees burst into bloom seemingly overnight! It was glorious! I had fun visiting many shops in the garment district. 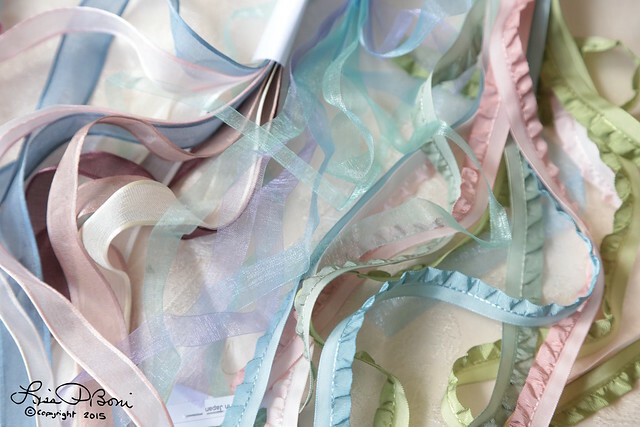 This lovely ribbon display is at M&J Trimming. 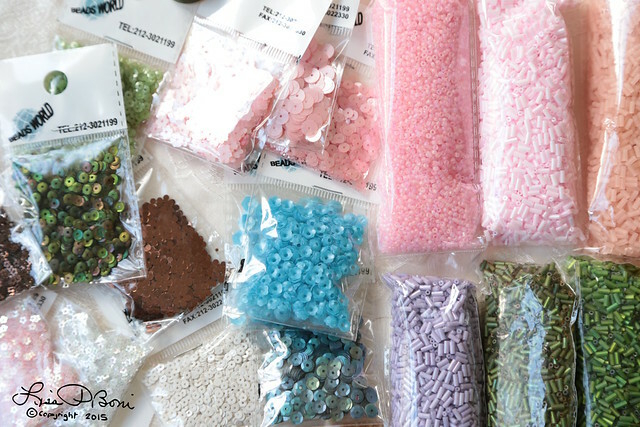 I came home with a new stash of beads and sequins! On my last day in New York City, the weather turned cool and rainy. 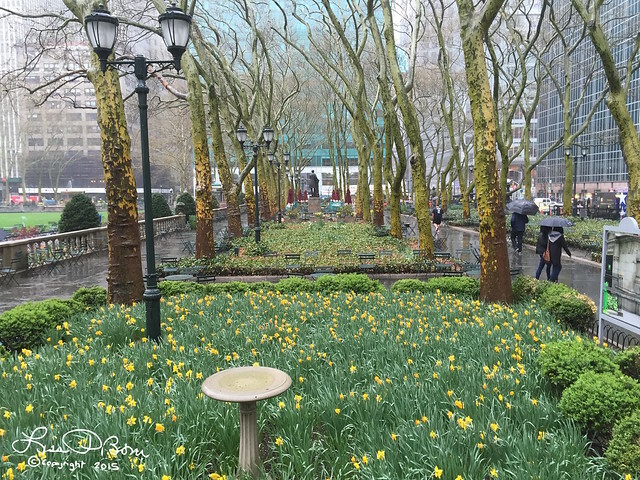 There was more shopping I wanted to do in the Garment district, so I got to visit Bryant Park again in the rain! Such a different feel to it, but still so lovely! 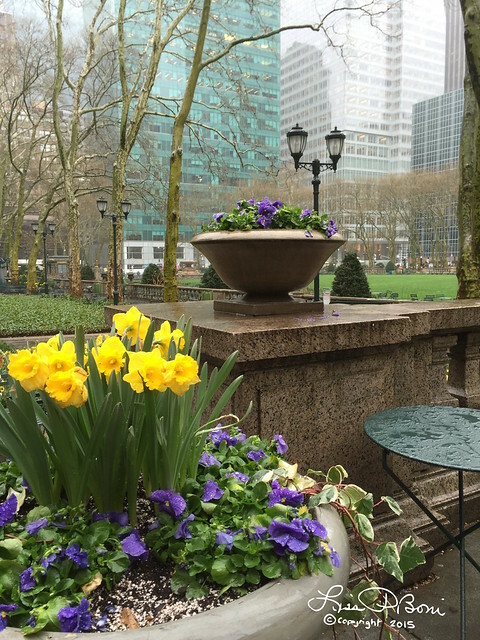 Even in the rain the city is still beautiful! 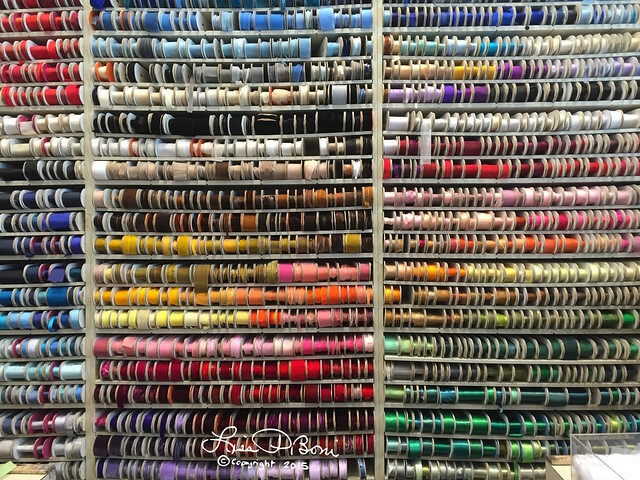 My big stop of the day was to Mokuba Ribbon. So many lovely things! 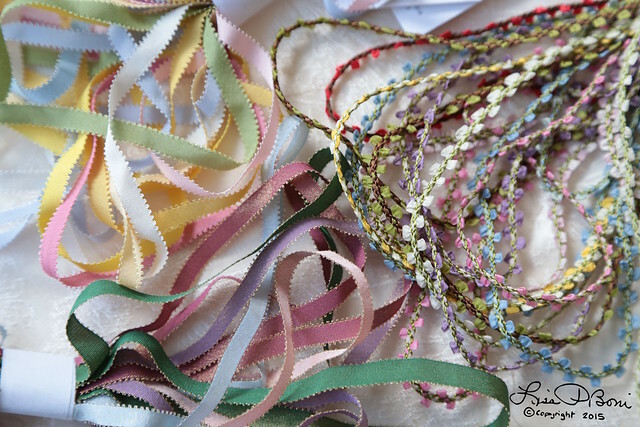 I came home with a nice bundle of ribbons and trims and can't wait to get started using them! Instead of spending another afternoon at one of the museums, I ended up spending the afternoon with my sketchbook at "Le Pain Quotidian's" main restaurant just off Bryant Park. 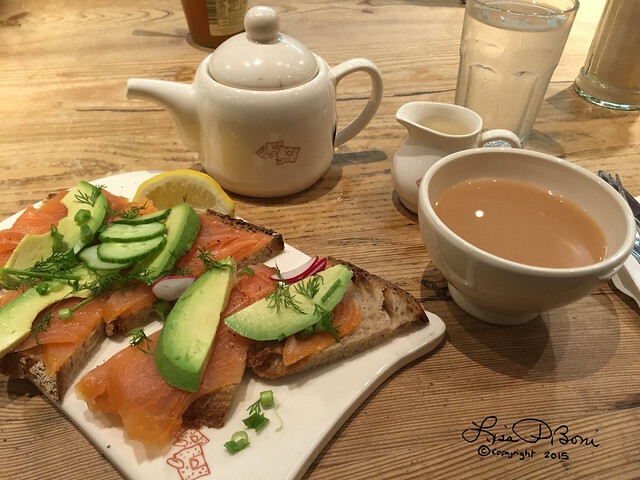 A pot of English Breakfast Tea and a lovely open face smoked salmon avocado sandwich was the perfect afternoon respite! Though I probably didn't see as much of the city as I could have, I loved my time there! 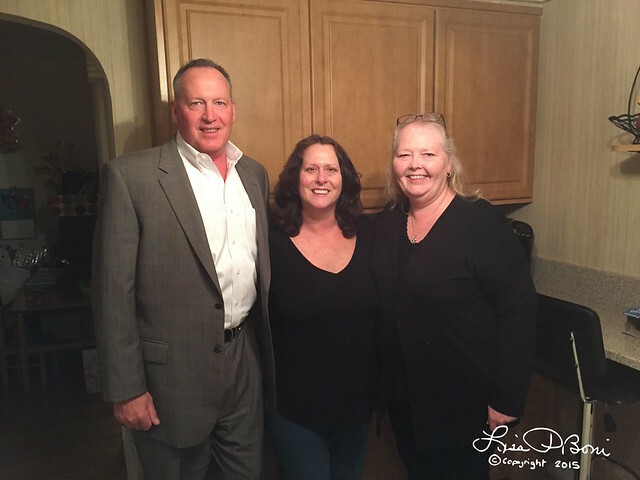 My New York weekend ended in New Jersey where I got to spend time with my cousins, Jeff and Tracy, that I hadn't seen in 35 and 40 years! What a joy to see them and to reconnect after all these years! Lovely post, Lisa! Great finds for your beautiful creations. I closed my blog, but am grateful I can still stop to visit here. Always a treat! It was so wonderful to see you! Love your photos. What a wonderful time you had!!! Oh my I would have loved to have been with you buying ribbons, beads, etc. WOW! You came home with some lovelies. The trims you got are just lovely. Glad you had such a nice trip!